To be honest I was eagerly expecting to receive this material from Hypnotic Dirge Records because I listened to a bit of it before and I was mesmerized by the music on it, and I'm not dispointed at all about the whole material. It's not every day you get to listen to a combination of Black Metal and Trip Hop, correct? 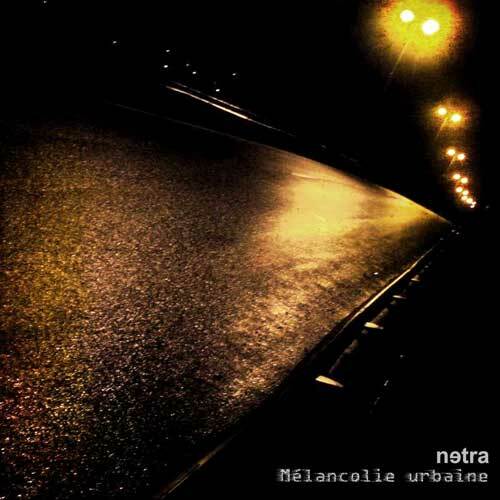 Well, netra does that combination and the result is very unique and original, a depressive jurney through urban landscapes, the perfect music for this album title. Although it has its repetitive moments, netra manages to keep your attention to its peak. So what we get here is: clean vocals combined with Depressive Black Metal screams, dark and cold keyboard atmosphere, slow to mid-tempo rhythms, very good sound, and a very tasteful songs composition. Definitely one of the best Experimental Black Metal releases of 2010, it is released in 1000 copies limited edition but I'm afraid those will sell out pretty fast, so make your move, you won't be disapointed. I won't rate this with a perfect 10 only because I think we'll get something even better from netra on the next release. Recommended! Where the heck come these Norwegians with all these ideas from? This album is absolutely fabulous! Nidingr should be a name that presents no misteries to any Black Metal follower, but anyway if you haven't heard of it yet just check some names from their line-up: Teloch (1349, Gorgoroth, Mayhem), Blargh (DHG, Gravferd) or Hellhammer (Immortal, Arcturus, Covenant, Shining, Emperor, Mayhem). Usually I'm not impressed by the line-up before listening to the material of a band although I asume it would have a high technical level, and the same happened for Nidingr, but once I was deep a few tracks into this album I became absolutely fascinated, the above mentioned high technical level is absolutely there, but it flows so smooth that the overall atmosphere becomes bewitching. Hellhammer is a monster, his drumming abilities are dangerous I would say, he even gives groove to some insanely fast parts, and man this is pure blasting art; vocalist Estrella Grasa spews his venomous vocal parts over a bedding made of very interesting guitar riffs and leads which share influences from modern and old-school Black Metal, '90's Technical Death Metal and modern Progressive Death metal at the same time. Great album, don't miss it if you're in search for some relentless Black Metal with Death Metal influences spiced all over. I have no negative comments towards this work, it fullfills my Extreme Metal requirements completely. Nowadays I guess everyone is aware of the South American appetite for Thrash Metal, and Chile is a country that rises more and more its Extreme Metal scene over the past few years. 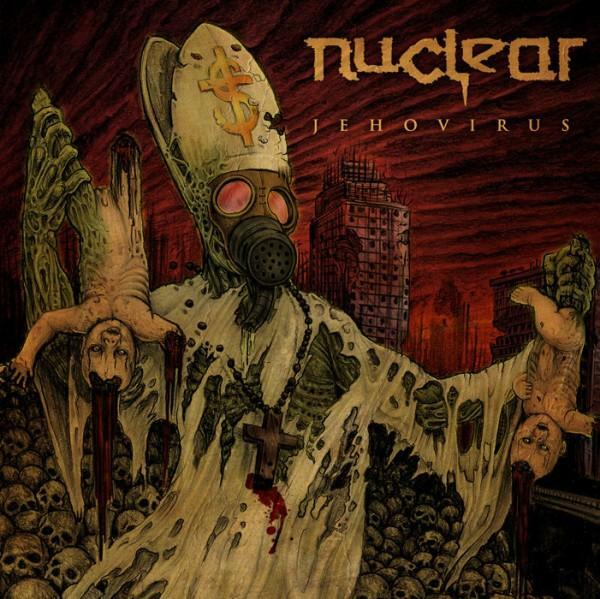 Nuclear is one of the leading names from Chile, a band founded in 1998 that has reached with this "Jehovirus" its third studio album to date. These 9 tracks were recorded in their country, but the mastering was done in UK by the famous Russ Russell (who has also worked for Napalm Death, Dimmu Borgir, Evile) so the expectation bar is raised even more. In almost 40 minutes of playing Nuclear present us their own view on Thrash Metal: fast, violent, old-school fashioned and straight to your face, no compromises indeed. Tons of catchy riffs, comprehensive clean but still thrashy vocal types, some razor sharp guitar solos sprinkled all over, and a crystal clear sound. A very good album with one fault, though, sometimes the band's compositions sound like they would have needed 1 more instrument, it feels like something is missing here and there. Anyway, if you're into Traditional Thrash Metal this will make your daily dose of crushing riffs. Nuclear Aggressor is back with a new release, this time it's an EP we're talking about. I have reviewed their previous (debut) release last August so it's nice to see such a hard-working band at least once in a while. 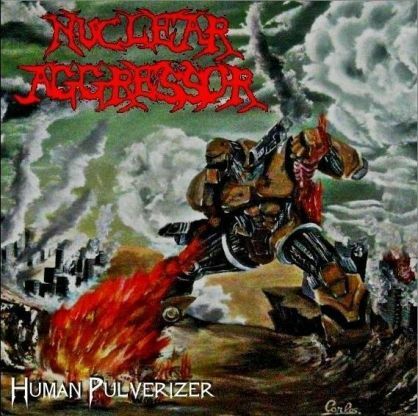 "Human Pulverized" is a step forward for the band from all points of view: although the music remained the same, uncompromising simple old-school Thrash Metal (this is a very good thing they keep the same path), now we're treated with a bit more complex rhythms and twists, the drummer included more variations in his playing, the lyrics have a better English, the music is catchier and the whole impression after listening to both releases is that the band improves in songwriting and even playing. The sound is the same old organic type a la '80's Thrash Metal scene. I hope they will try to find a label to release their stuff on vynil, that's the best format for such music. Catchy, honest music. Recommended! Pandemonium are a well-respected and well-known Extreme Metal band but only within Polish territory and I can't imagine why is that. The band was formed in 1990 so we're looking at a band that has been around for more than two decades now. Impressive. 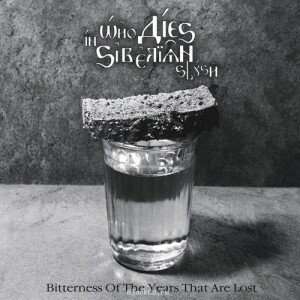 This album, although released in 2007, was sent to me together with a live CD i'll be reviewing later. I guess you can still buy the album from them or their label. "Hellspawn" is a 10 tracks release that reminded me of both Master (because of the hoarse vocals) and Vader (because of the dark atmosphere and intensity created by the instrumental part), so yes, this is a pretty tight and solid album that can compete at any time with any other Black Death release. The music is very catchy, we're treated with a massive guitar work both vicious and melodic, and adding the hoarse vocals, plus the very well thought background vocals insertions, "Hellspawn" demonstrates what a band with such experience under their belt can do. The first review of a Live VCD on Pest Records, Pandemonium's "Two Decades of Unholy Existence" is composed of 7 live tracks recorded, I guess, on their 20 years anniversary show. There are tracks from all their releases, from the '91 rehearsal demo to their 2007 third full-length album "Hellspawn" and even some new ones, a real treat for their fans. What can I say, the band sounds as good live as on the studio album, very tight, professional, brutal and technical. The sound is very good giving you the chance of almost living the real experience of a Pandemonium live gig. Too bad there are so few tracks, I would have liked them to be more on this CD. Killer band! Percival Schuttenbach is very untipical folk metal band. They started a many, many years ago and they always broken stereotipes, they always walking just own way. 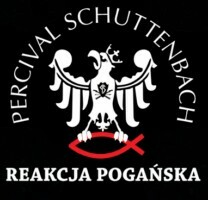 „Reakcja Poganska” („The Pagan Reaction”) is a story of one of Polish forgotten prince, who would like to came to heathen religion in Poland in medieval time. But this is not a typical „concept album”, track just based on unknown pieces of Polish medieval history, but every track are a tales about other situations. Some of it are taken from traditional Polish and Belarussian folklore and connected with heavy metal. One of these tracks, called „Braniewo Song” was a nice history, that was recorded after the afterparty od „Slavs and Vikings Fest” in Wolin, and this track was composed by ordinary people, who was on the party. 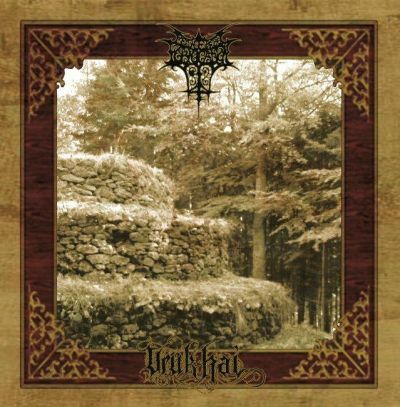 This is a good example of contemporary urban folk ;) „Reakcja Poganska” is not pathetic, this is just folkmetal, playing for fun, for party, for good atmosphere on thre gigs. This is a folklore paganism connected with oldschool heavy metal with vikings and slavic folk influences. This album was a vice-leader of Polish folk albums in 2010 in one of fan’s internet competition called „Wirtualne Gesle”. „Reakcja Poganska” included a lot of good sens of humour and talking about very important things. Great band, great album !!! I don't know why Profane Prayer sent me their 2006 demo for review, it's 5 years since this demo was released, but I guess they still have copies left and it can be ordered, or this is a re-issue of that demo (although not mentioned anywhere), otherwise I can't explain it. The band was founded in 2005 in Athens, and this one is their first and only demo so far, a 4 tracks release lasting for 13 minutes of mid-tempo to fast Black Metal. Nothing new or original here, but the music is catchy, even groovy (on drums), with good, organic sound, and the whole atmosphere is somehow related to the old-school '80's Thrash/Black Metal, so here we have a good demo that's not done in a hurry or with lack of respect for the listener. 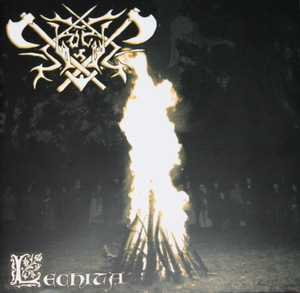 The guitars on the first track remind me of Wiccan Rede's demo (early Negura Bunget). Anyway, Profane Prayer recently released their debut album as free download on Misantrof AntiRecords, if you like that one you can give back to the band by ordering this demo as well, I guess it comes pretty cheap. 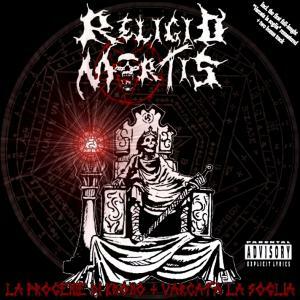 Religio Mortis is a band formed in 2008, a pretty unlucky band from what I see. Unlucky regarding its line-up, because the two members that make the band at the moment are searching for a stable line-up since 2008. Anyway, although only two, they have managed to release 1 demo in 2008 and their debut album in 2009. Here I have their new EP, EP made of 3 tracks and as bonus the complete debut album from 2009, plus 2 other as bonus to the bonus if I can say so. After listening to this release I can say Religio Mortis is a Thrash Death Metal scene with a powerful hint of Speed Metal, all of it presented in an old-fashioned manner with raw (but not that bad) organic sound, and an overall Horror inspired atmosphere. The most prominent element in their music is the Thrash Metal one, especially on guitar; old-school thrashy guitar riffs, catchy enough, supported by a fast rhythm section and a combination of clean and vicious vocals with background growling vocals. Recommended only to fans of old-school dirty and violent Metal. A new VCD for Pest Webzine to review. These releases are not so common nowadays with the YouTube dominion, but it's good they still exist and some bands still keep it old school. This is Sanguinary Misanthropia's case, an Old-School Black Metal band from Australia recently signed with US based label Abyss Records, if I'm correct. What I have here, or better said what I should have here, are 6 tracks recorded during one of their live gigs, but unfortunately I have only 3 of the 6, the other were not burnt correctly so they are only Copy of... files. The band, although being a trio (or because of this?) sounds pretty tight and mature, their Black Metal is aggressive, raw and catchy, not monotonous at all. The sound is also acceptable, so it was a good way to spend a few dozens of minutes watching this a few times, too bad I don't have the complete tracklist. Don't know if it's for sale, but you can ask the band directly. Sanheim is a young Russian band founded in 2009. This is their debut EP, a 4 tracks effort lasting for 17 minutes of Old-School Thrash Metal. '80's style all the way, from the music to the sound everything's old-school inhere. The sound is so organic, rehearsal-like, that on the first track I was under the impression one of the guitars is actually a cello, and I'm still not sure it's not, haha. The music is mostly fast paced, catchy enough and quite aggressive, with the benefit of a vicious vocal part and very good, razor-sharp guitar solos. They still have some work to do, especially on drums, but they are young and have all the future ahead. If you're into early Metallica and the '80's demos sound than this EP is for you, a breath of dusty air in our nowadays so clean and sterilized metal scene. 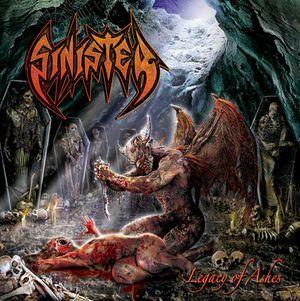 With their 10th album (9th studio album) Sinister delivers exactly what their fans would expect them to, 9 tracks of fast Old-School Death Metal the Sinister way. Nothing less, but unfortunately nothing more either. I mean the album is tight as hell, very aggressive and displaying the same excellent guitar riffs, 100% Death Metal, but there is no innovation and sadly Sinister starts to sound somehow limited. I know this sounds very harsh, but that's the truth, there are countless new bands out there that raise the standards of Death Metal every day so I don't see this Dutch legends gaining more fans with this new release, like they did with, for example "Aggressive Measures". Of course, it will satisfy all their die-hard fans because it's not at all a bad album, it's catchy and technical, but I guess you understand what I mean here, it lacks something, it's one thing what you would expect from a new, young band and it's totally different for a band like this. Their music seems to become more and more centered around the guitar riffs and forget about the rest, including overall atmosphere. This new band from Finland was founded last year on the ashes of a Thrash Death Metal act called Point-Blank who had a pretty scarce activity I would say, releasing only 2 demos in 5 years of activity. Now Spiritual Holocaust kicks it in from the start with the release of their first demo the same year the band was unleased. "Salute to Death" is their first effort, containing 4 tracks in almost 20 minutes of mid-tempo Death Metal with some Doomish influences. Their music nests in the groovy area more than in the brutal or technical ones, so it seems we're dealing with a band that tries to create more feeling than aggression, we'll see if it'll work for them. The 4 tracks, even if the guys mention Morbid Angel, Nile or Hate Eternal as their main influences (which is true to a point), seem to me more old-school Scandinavian inspired, and here I'm thinking of the cold and extremely dark mood the masters of Scandinavian '90's Death Metal lused to create. To be honest I like the first 2 tracks better than the other 2, they are more straight to your face and groovy, weather the 3rd and 4th seem a bit too repetitive and lost my interest; the guitar leads and melodic solos on the first two are great, plus the way the bass is more involved in the whole music. This band has potential, that's for sure, although they are not there yet. 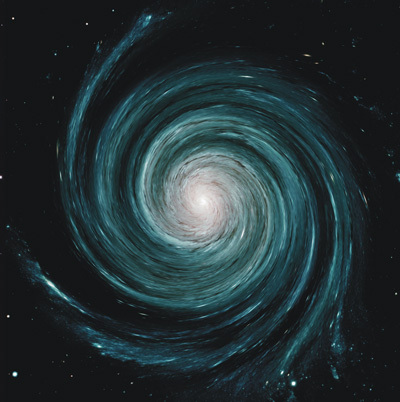 I have almost none or no information on this band/project whatsoever... What I have been able to find on the net is that Spuolus comes from Hungary and this one is their debut album, a 4 tracks effort lasting for an hour of, how they call their music, Cosmic Black Doom Metal. I would have to disagree with their description as I cannot find almost any trace of Black inhere, I would label the music inhere as Atmospheric Funeral Doom and nothing more. After one spin I can say there are some good, catchy ideas especially on keys and guitars, but the overuse and oh so repetitive display inhere made my listening a tough one. Whenever I was getting used to the atmosphere created by the compositions they started to repeat over and over and from what I thought would get me into a state of meditation and calm, made me angry and anxious. Don't get me wrong, this album has a good sound and some really good music parts I have enjoyed too, but again, the overuse of those parts doesn't make it on my fave list. Maybe you'll like it more than I do, so give it a spin if you're into Funeral Doom. 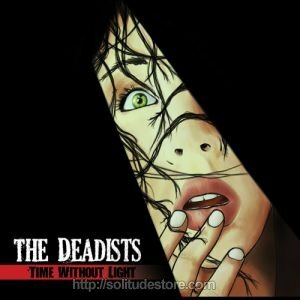 The Deadists come from Sweden and were formed as a band in 2001 but only managed to release 2 EPs until now, and this one I have here is the second. "Time Without Light" is a 5 tracks release totalizing almost 35 minutes of Stoner Doom Metal with strong influences from other music areas like Sludge Metal or Post-Rock. The whole is a very interesting but hard to penetrate slab of groovy music lead by heavy guitar riffs, aggressive vocals, low-tunned bass playing an important role as well and organic, complex drums work. This will fit not only in the Stoner Metal fans collections, others might like it as well. This is Until Graves' second demo released in 2010, a 5 tracks effort lasting for a bit more than 25 minutes, so we're dealing here with quite long tracks. After listening to it I'm not sure they have a well determined project for the future, and by that I mean the music on this demo seems to go in different parts, there is no middle ground for it, so it's really hard to name it Melodic Death, Melodic Thrash Death, Gothic Death or Gothic Thrash Metal because actually they have elements from all the mentioned areas. There are some good ideas, catchy riffs and some old-school Gothic Death Metal parts that I really like, but not enough to consider this band as a well curdled and solid one to attack the scene nowadays. And also I hope they get a better sounding keyboard next time (and here I mean the actual instrument, not the guy playing it), this one sounds too out of date and is unable to bring any plus to the band's musical atmosphere. Uruk-Hai is an Austrian one-man-project with an insane number of releases out, more than 100! Yes, this is one of those projects that release as many materials as possible. Only owning its discography and no other, you can be considered a big Ambient Music collector. The music on Uruk-Hai's side is actually better than I would have expected, although not even near a masterpiece of the genre. Keyboard based, Uruk-Hai's music is, of course, inspired by LotR, even the movie cuts are from LotR, but the whole sounds more a preparation for the actual music, you feel like ok, something's gonna happen now, but nothing does really. Better said this is like a prelude to the actual music, even if this is, in fact, the music. Good and interesting, but not complete; better than a lot of other such projects though. Funeral Fornication is a one-man-project as well. Founded in 2003, it released 1 full-length album and this split, a new opus waiting to be released this year through Hypnotic Dirge. Unlike Uruk-Hai, Funeral Fornication is a Black Metal project, or better said a mid-paced Black Metal project with strong Dark Ambient influences and even some Doom Metal additions here and there, especially on guitars. The music has a deep depressive atmosphere surrounding it, and also a deep underground feeling when it somes to sound. What I like the most in its music are the cold, dark and sinistre keyboard intros and also some guitar lines, but on the whole I cannot say I was too impressed with Funeral Fornication's side. With a better sound quality this music could have a better impact. I have reviewed this band's debut demo in 2009 and it wasn't such a good review, so I was curious to see if they have progressed on this new 3 tracks promo. The answer is yes, they show an obvious progress on both instrumental execution and overall sound of this demo. The atmosphere I would expect from a Black Metal band is still not completely there, but there are parts where they show they can combine extreme aggression with inventive guitar lines, and that's a very good sign. The tracks are much better compared to their first work and I like the fact that their guitarist isn't afraid to ad his touch (a very good addition I would say). So all in all only positive words about thier latest work, good improvement, but to name the bad parts also I would say the sound, very rehearsal-like, but comprehensive, and for a promo or demo, name it how you want, it's quite ok.
As their first demo, this one is available for free download, too. Formed in 2003 as a one-man-band, WDISS recently became a full line-up band and signed a deal with Solitude Productions. The first child of this marriage is their debut album, a 7 tracks release lasting for 45 minutes of Funeral Doom Death. The music is sad, depressive and melancholic and not so repetitive as I have expected it to be. There are some good piano insertions here and there just to make the whole more interesting, but for me the best part of this release, although I usually don't read lyrics, is how the lyrics are layered, the guy who wrote these has some talent indeed. So all in all this is a very deep and heavy release for fans of melodic Funeral Doom with some Death influences.